272 pages | 10 B/W Illus. The U.S., and countries across the globe, are facing an ever-evolving series of health issues. Locally, we face issues of obesity, food deserts, child hunger, poor maternal health outcomes, and the resurgence of communicable diseases because of the anti-vaccination movement. We talk about health in a vacuum – we see health information as only being appropriate for health-related contexts- when people are looking for health information, they go to health websites. But if we are to make health an important piece of our everyday lives, then we need to weave it into everyday conversations and experiences. Ultimately, we need to normalize the conversation around health. However, the world of online influence is bigger and more diverse than just a series of digital tools- and more and more, we are engaging with them for health-related information. The emergence of everyday online opinion leaders has created a whole new market for shifting consumer perceptions and behaviors. In fact, many of these everyday online opinion leaders have built such large social media presences that they now have a voice, the platform, and the following to reach millions of people with personal points of view on any number of topics. The opportunities for engaging with online influencers to support marketing and health promotion programs are great; however, navigating this online community is new to many people. Understanding how this online community works, the opportunities for paid and unpaid engagements, and the value that health programs, specifically, have with this community, is paramount to successfully working with online influencers. 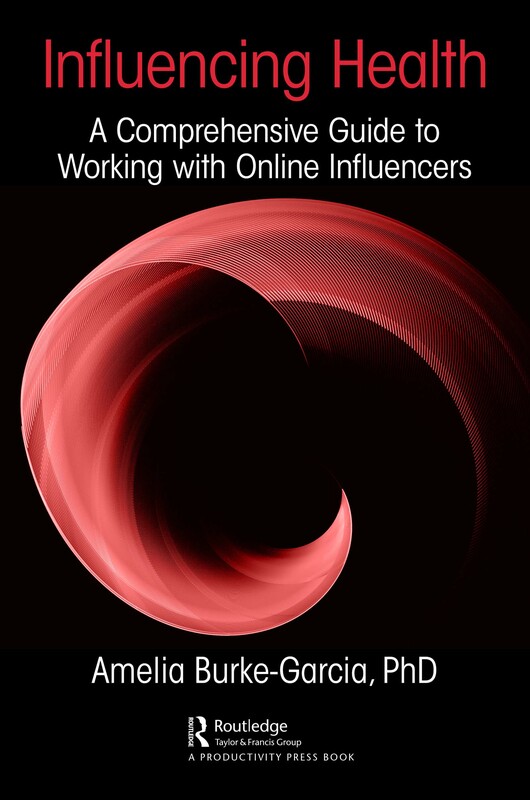 This book draws from research with over 600 online influencers, the latest industry data, and practical, real-world experiences working with influencers over the past ten years. An easy-to-read guidebook for marketers and health communicators alike, this book leverages storytelling as a means for sharing lessons learned and providing readers with practical knowledge about the online marketing industry and influencer community. Dr. Amelia Burke-Garcia is an award-winning digital health communicator and researcher with more than fifteen years of experience creating innovative and impactful digital interventions for public health initiatives. Currently, she runs Westat's Center for Digital Strategy and Research and leads numerous influencer-focused efforts on behalf of the Centers for Disease Control and Prevention (CDC) and the National Institutes of Health (NIH). Dr. Burke-Garcia has been singularly examining the role of influencers in health communication and research efforts for more than a decade, including the role of payment in this space. Dr. Burke-Garcia began her work with influencers in 2006 when she worked for Horizon Media. During this time, she led what was then called Organic Marketing and used fledgling networks of influencers to promote products and brands. After two years of working in the private sector, Dr. Burke-Garcia came back to public health and ran the first-ever Tweet-a-Thon with online mommy influencers to promote adolescent vaccination. Since then, she has led CDC’s National Influenza Vaccination Campaign, which utilized celebrity influencers such NFL Hall of Fame players, Carl Eller and Barry Sanders, as well as everyday influencers such as mommy bloggers, Pregnant Chicken and Beer and Babies, to promote and encourage seasonal flu vaccinations. She has continued to lead the field in this area with her current contract to support CDC’s National Center on Birth Defects and Developmental Disabilities (NCBDDD), which is building an influencer platform to disseminate their health messages. She also has co-led a research studies focused on influencers funded by NIH. Other professional experience includes her work at international nonprofits, AED, and Management Sciences for Health. Dr. Burke-Garcia finished her dissertation in 2017, which examined online influencers as opinion leaders for health information dissemination, the findings from which concluded that the online influencer space has undergone a major shift in recent years, turning from what was once a more informal space for content and idea sharing to what is now a more organized—and monetized—marketing channel. As well, her dissertation research found that while monetization is an important part of this world, not all influencers require payment for engaging in health-related campaigns, and that trust and credibility play important and symbiotic roles in the relationship between an influencer and his/her followers and the brands and campaigns that influencer chooses to partner with. Dr. Burke-Garcia is the author of the S.O.C.I.A.L. framework for planning and evaluating digital media campaigns, writes and maintains a blog at www.dr.ameliaburkegarcia.com, and has been published in numerous journals and books. She has been called a Social Media Icon by PR News Group. She has her undergraduate degree from McGill University, her master’s degree from Georgetown University, and her Ph.D. in Communication from George Mason University.